Someone asked me today what I wanted for Christmas. I always find this a scary question, what are you supposed to say? Well actually I'd quite like a new car, and if you're offering a nice helping of the McQueen Silk Scarves that I love would be nice. And ooooh what about one of those MacBooks I've been lusting after? ﻿ ﻿ ﻿﻿﻿﻿ ﻿﻿ ﻿ ﻿ So there we have it. 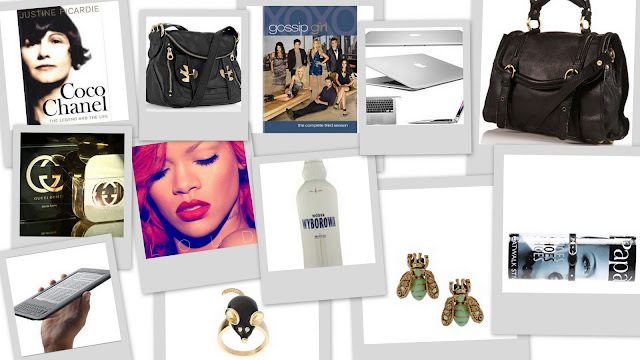 The things on my wishlist, some more realistic than others, but a girl can dream. What are you wishing for this Christmas? Anything you think I've missed? Oh that mouse ring is too cute for words. I always struggle - I love surprises so don't really like to present people with a wish list. I'm with you, I like a surprise and I was always brought up not to ask for things although I have to admit, it was quite fun looking at pretty things! The ring I LOVE too.